A new technique to alter the genome is revolutionising cell biology. Described by Zoe Corbyn in the Guardian as “a pair of molecular scissors guided by a satnav”1, the CRISPR-Cas9 system fundamentally improves the ease and accuracy with which edits to the genome can be made, including in human cells. Edits allowing scientists to create mutations to stop genes from functioning, or repairing mutations in genes by hijacking the body’s own DNA repair mechanisms. The CRISPR-Cas9 biological toolkit evolved as a mechanism to protect bacteria from aggressive viruses trying to penetrate their DNA to replicate. In order to destroy viral DNA, the bacteria used the CRISPR-Cas9 system to create a bundle of proteins which recognised the viral DNA when it entered the cell and then chopped it into pieces to destroy it (cleavage). A few modifications to this machinery in the lab, allows the protein bundle to recognise any piece of DNA and cut through both strands in a specific place. This is known as targeted double stranded DNA breakage. Double stranded DNA breaks can occur naturally in the genome due to insults to the DNA so the cell has well designed methods to repair the broken DNA. 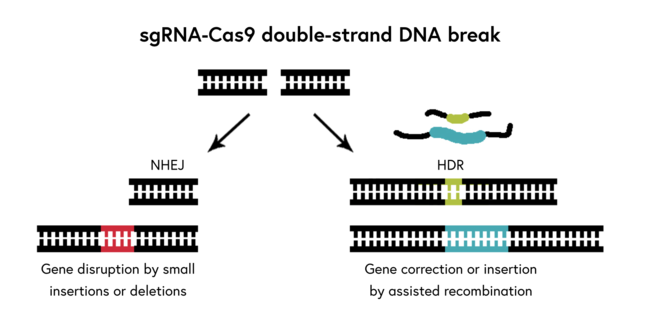 The two major repair methods for double stranded DNA breaks are known as Non Homologous End Joining (NHEJ) and Homologous Recombination (HDR). This method uses enzymes to repair the ends of broken DNA and then stick them together. NHEJ is not designed for accuracy and leads to the creation of insertion or deletion mutations within the DNA. If these indel mutations are created within a gene coding region, they can potentially cause a loss of gene function. Scientists can therefore use the CRISPR-Cas9 system to disrupt genes and stop them working. This could be used to create cell or animal models of human disease, or used to switch off activated genes causing human disease, such as oncogenes in cancer cells. This method is a normal DNA repair mechanism for double stranded DNA breaks in human cells. It is an accurate way of repairing DNA by using the same genomic region from the other chromosome pair present in the cell as a repair template for a break on the other chromosome. This system can be hijacked by adding a strand of complementary DNA you want to be incorporated into the repair site alongside the CRISPR-Cas9 machinery. The cell will recognise the strand of DNA as being a useful repair template and incorporate it into the original piece of DNA, and then stitch the break together. 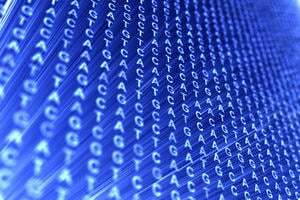 Imagine a cell containing a stretch of DNA with a mutation present. The CRISPR-Cas9 system can cut the DNA so that the mutation is removed. A stretch of DNA without the mutation in is then added as the repair template. The cell will use the unmutated DNA strand to repair the original DNA, and the mutation will be replaced by normal DNA again. This technology has the potential to allow scientists to accurately correct genetic disorders and potentially cure genetic disease. Scientists in China have recently used the CRISPR-Cas9 genome editing technology to try to repair human embryos containing mutations causing the blood disorder Beta-thalassaemia2. These embryos were fertilised by 2 sperm and would never have been viable. Should we allow research using genome editing in human embryos? What are the potential ethical implications of such research? 1. Zoë Corbyn Crispr: is it a good idea to ‘upgrade’ our DNA? The Guardian 10 May 2015.